Cap up to 12 cm, at first hemispherical, later convex, pastel yellow, pale yellow to pale orange, spoted light orange, dark orange or reddish orange, velvety then more or less smooth, strongly blueing when bruised. Stipe swolen or obese, pastel yellow, light yellow to vivid yellow, covered with dense very fine orange red or scarlet red network; stipe surface blueing strongly at the slightest touch. Flesh firm and very dense, lemon yellow, sometimes red in the stipe base, blueing instatly when exposed to the air then fading in half an hour and then changing to dingy orange red. Tubes, yellow, bluing when exposed to air. Pores bright red, occasionally orange red nearly the cap margin, blue-black when bruised. Smell not distinctive. Taste rather acid. Spores 12–18.5 × 5.5 μm, ratio 2.2–3.5. Pileipellis (the cap cuticle) a trichoderm of septate hyphae of long cylindrical cells. Chemical reactions: hyphae of the flesh at the stipe base inamyloid with Melzer’s reagent. Habitat. Warm deciduous forests, mycorrhizal with oaks (Quercus) and sweet chestnut (Castanea). Distribution. More or less southern species that might be under-recorded. So far known from Bulgaria, Corsica, France, Germany, Italy, Spain and Switzerland. Possibly seen in Greece (see Κωνσταντινίδης 2009). 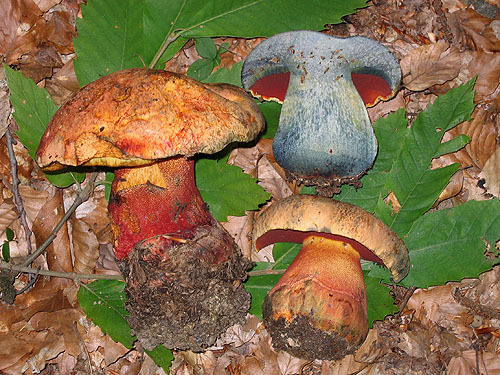 At least part of the Hungarian records of Boletus torosus also belong here (see illustration in Károly 2009). Recently spotted also in Slovakia (see photographs here) but no published records are known from this country yet. Similarity. 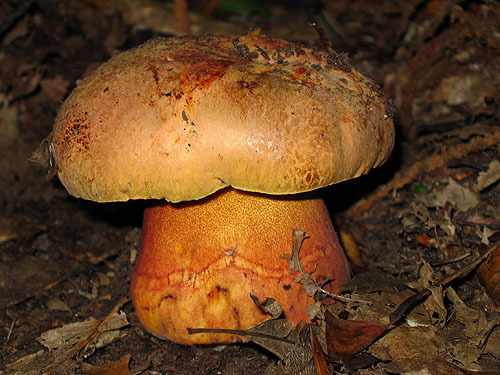 Similar to B. rhodopurpureus, which has differently coloured cap. Might be confused with B. torosus, but the later has cap with more or less developed olivaceous tint and yellow pores. Bertéa, P. & Estadès, A. 1990. 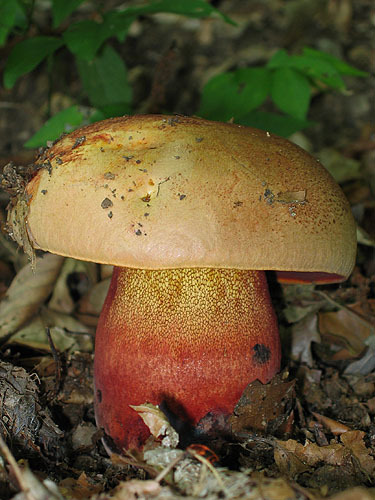 Boletus luteocupreus sp. nov. – Documents Mycologique 20(78): 10. Bertéa, P., Estadès, A. & Redeuilh, G. 1991. Sur la validité et la légitimité de Boletus luteocupreus Bertéa et Estadè s. – Documents Mycologique 21(82): 7–8. Martinelli, G. & Senn-Irlet, B. 2008. Boletus luteocupreus – Der Gelbhütige Purpurröhrling aus der Schweiz. – Schweizerische Zeischrift für Pilzkunde 86: 91–94. Schreiner, J. 1997. Boletus luteocupreus Bertéa & Estadès, Gelbhütiger Purpurröhrling, Erstnachweis für Deutschland. – Mycologia Bavarica 2: 2–11.